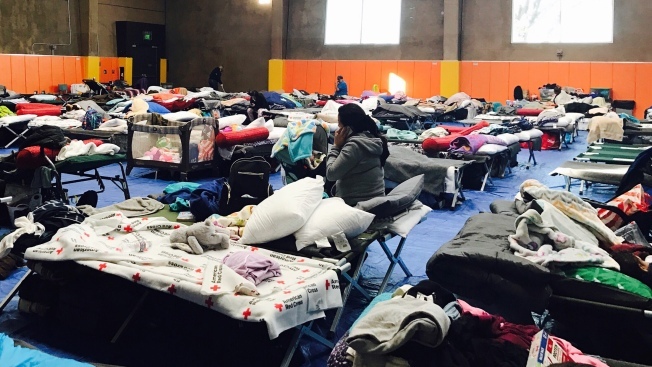 The San Jose City Council on Tuesday will consider to declare a shelter crisis stemming from the historic flooding that uprooted thousands of people from their homes and continues to leave residents without a permanent roof over their heads. Kris Sanchez reports. The San Jose City Council on Tuesday will consider to declare a shelter crisis stemming from the historic flooding that uprooted thousands of people from their homes and continues to leave residents without a permanent roof over their heads. Under the recommendation, city leaders will decide whether or not the Seven Trees Community shelter will remain a temporary shelter through May 31. Seven Trees has been the primary flood shelter since high-rising water spilled over Coyote Creek's banks, swallowing cars and inundating homes with contaminated water three weeks ago, but some shelter residents claim the cramped living situation has caused illnesses, including pneumonia, to spread. The city will also consider to hire housing provider HomeFirst to help manage the flood shelter as well as arrange other temporary living spaces and services for flood evacuees and the homeless community. While city officials continue to provide relief services and volunteers clean up the muck, San Jose Mayor Sam Liccardo penned a letter to the Santa Clara County Water District demanding more information in hopes of preventing a catastrophe from plaguing the South Bay city in the future.